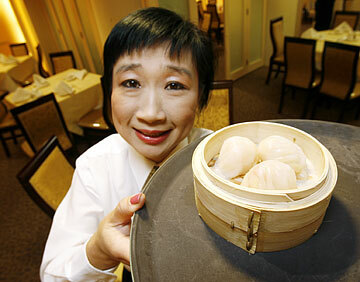 It seemed sudden when Larry and Linda Chan said goodbye to their trio of Eastern Garden restaurants about a year ago. With the opening of their new restaurant, the Mandalay, on the site of the former Yong Sing restaurant on Alakea Street, it all becomes clear to anyone who has ever played the game of Monopoly. It's like skipping over the trio of Oriental, Vermont and Connecticut avenue properties in the 'burbs in favor of the glitzier Boardwalk or Park Place properties, or swapping little red houses for one big green hotel. It's a very ambitious acquisition. Right now, the Mandalay's a couple blocks away from the downtown hot spot that's emerged along Nuuanu, Hotel, Smith and Pauahi streets, but with all the Beretania Street high-rises due to be completed within the next two years, it's just a matter of time before residents in million-dollar condos start calling with their hunger pangs. The Chans just have to hope they have money to spend on meals after the mortgage is paid, because dim sum prices are about 25 percent higher than those of most Chinatown restaurants, and evening prices are about double. That might be expected with the cost of renovating the old space. You're mostly paying for service -- waiters are constantly checking on your tea level and asking if everything's all right -- and sparkling newness, because food at lower-priced Little Village and Glowing Dragon a few blocks west is just as good. Mandalay could almost be considered a restaurant for non-Chinese who always feared the Old World, let's say "earthiness," of Chinatown, but for now, friends and fans of the Chans seem to be enjoying catching up with them. The familiar red moon gate of Yong Sing is gone, replaced with a polished sand-colored stone exterior. The room itself is spare and clean, done up in golden hues, though still with the bright lights that have somehow become mandatory for Oahu's Chinese restaurants. If you don't have time to sit down for lunch, there's a companion express operation that starts up at 10:30 a.m., offering plate lunches to go, a must for workday traffic. On the weekends you can settle back for cartless dim sum dining. You're handed a laminated menu featuring photos of specialties, along with what looks like a ballot for voting on the most appetizing candidates. Make sure you mark the right box, or the one dish you want might turn into two or three of the same. The dim sum falls into five, instead of the usual three categories of small, medium and large. Here, small plates are $2.25. The bulk of basic dishes fall into the medium category (indicated with an "M" on your ballot), at $2.85 per plate. At the high end, deluxe dim sum ("DX") runs $5.95 per order. In the medium category are such basics as bean curd rolls, spare ribs with black bean sauce, pork siu mai and Chiu Chow dumplings in a glistening, near-transparent wrap. The dim sum is actually an improvement over the artless dumplings served in Eastern Gardens' waning days. Server Oi Ling Lai presents an order of dim sum at Mandalay Restaurant, where the bamboo steamer baskets and surroundings are pristine. DINERS MIGHT experience some sticker shock in the evening, when prices start at $8.95 for hot-sour soup and $9.50 for sautéed beef with vegetables, escalating quickly to $12.95 for pepper-salt shrimp and $15.99 for honey-walnut prawns. Smoked tea chicken ($14.50 half, $28 whole) has an exceptionally crisp exterior worth trying. Lobster is offered at market price, most recently $28 per pound, so this might not be the best place to satisfy your craving. In addition to ginger-and-green onion and other traditional preparations, Mandalay offers an unusual crispy garlic and egg yolk preparation in which the lobster is battered up and deep-fried for a crisp, light, omeletlike coating, then topped with unnecessary bits of deep-fried pork. I didn't love the preparation but I didn't hate it, either. While I sort out my feelings, you could play it safe and try the similar dish made with shrimp for only $12.95. Broccoli was the main component of a dish of Scallops and Vegetables in X.O. Sauce ($13.95). The sauce was flat, with little flavor beyond that of chili pepper flakes tossed in to spice it up. There was also little greenery involved in the stir-fried Vegetarian Delight ($8.50), which featured chopped carrots, baby corn, water chestnuts, bamboo shoots and bell peppers. I don't think Mandalay will turn out to be anyone's neighborhood Chinese restaurant, but there's room in the area for a special-occasion restaurant that combines Chinese cuisine with gleaming surroundings and attentive service. How unusual is that?